Oh good, that headline worked as planned. I used an odd number as recommended by clickbait experts, and you clicked. The system works. No, this post does not contain a quiz that will tell you what species of dolphin is your spirit animal, but it does contain news of 11 bugfixes and the status bar thing is pretty cool, so it was more hyperbolic than dishonest. Anyway, the latest version of Marked 2 (2.5.30) is available on all channels now (Mac App Store, direct, and Setapp). I’ve been holding off posting about it until the MAS review finished, and I’m pleased to announce that after 3 weeks, it finally has. One of the new features in this release is the ability to hide the status bar. This works in both windowed and full screen modes. 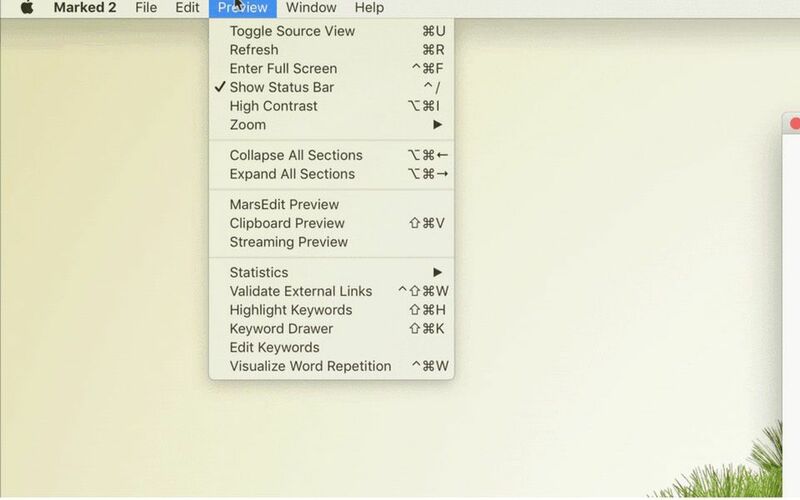 Use Preview->Show Status Bar to toggle it on and off (or use the shortcut Ctrl-/). When hidden, hovering over the lower part of the screen will reveal it and allow clicking on any of its buttons. This feature has been repeatedly requested over the years, and while not one that I considered high priority, I found an easy way to pull it off and decided, why not? I’ve also added a URL handler method for “defaults”. This allows the user to create urls that will toggle preferences. It’s not a front-facing feature or one that will be useful to most people, but it will allow me to create URLs in the help system that toggle existing preferences and possibly some future esoteric preferences that might not be part of the Preferences interface. This was inspired by some other apps, including Curio. The URL handler also opens up some scripting possibilities that Marked’s current lack of AppleScript support makes inaccessible. Switching the processor from MultiMarkdown to GFM, for example, can be done with a URL call to x-marked://defaults?processor=discount, or switch syntax highlighting and MathJax off with one call to x-marked://defaults?syntaxHighlight=0&includeMathJax=0. More to come. There was this long-running glitch where turning the custom processors on and off using the indicator lights in the status bar of the preview required multiple clicks to get it to stick. That’s fixed. Finally. If you work with Markdown and haven’t picked up Marked 2 yet, now’s a great time. I mean, you’re late to the party, but we’ve been waiting patiently for you. I even have a coupon for you so we can get the party started: IMFRIENDSWITHTTSCOFF will get you 20% off the direct sale version. Grab the Marked 2.5.30 update via the Mac App Store, Setapp, or the automatic updater in the direct version (Marked 2->Check for Updates). And don’t forget, IMFRIENDSWITHTTSCOFF will get you 20% off!